The Philistines assembled a massive army of chariots, cavalry and infantry so numerous that they were like the sand of the sea. The small force that Saul cobbled together in comparison was poorly equipped and the majority of the men hid themselves. Nevertheless, God moved upon Jonathan and his armor bearer to attack a Philistine garrison, holy angels created an earthquake and the Philistines became so confused that they attacked each other. It was a great victory for the Israelites but Saul's ego got in the way and the people had to protect Jonathan for his alleged disobedience. Saul would go on to attack Moab, Ammon, and Edom. 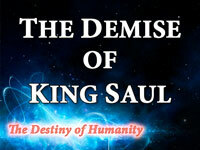 Then the Lord told Saul to attack the Amalekites and utterly destroy them. Saul spared King Agag's life and the best of the livestock, but because of his rebellion, Samuel told Saul he was no longer God's anointed. The Holy Spirit departed from Saul and he no longer heard from the Lord. Saul spent the rest of his life in an off and on again relationship with David until he committed suicide. He started out strong as a young man, on fire for the Lord, but poor decisions changed his legacy.